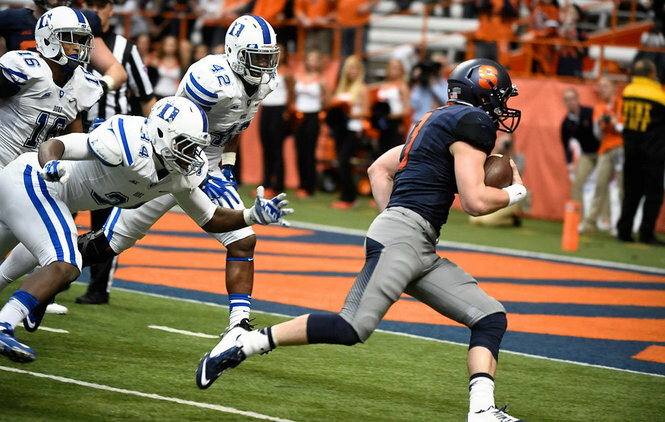 I made a once-in-a-lifetime trip to Syracuse to see Duke football at the Carrier Dome last Saturday, largely because my daughter, Abigail, and I had the opportunity to sit in the first row behind the Duke bench. A long-time friend and ‘Cuse booster knew we’d get a kick out of it, so gave me his tickets (thanks, Marco!). It was thrilling to see the action from that close, but I also have a better sense of the secret sauce for why they’re having a great year: it’s how the players have been coached to behave as part of a team. 1) Allow team members the latitude to be themselves. We arrived around 90 minutes before kickoff (why not?). It was clearly unstructured time – some players came out, others did not. Some came out individually, others with a friend. Some were serious, wearing their Beats headsets, while others were just goofing around. They all weren’t dressed alike, etc. 2) Rituals help remind the team that they ARE a team. When the team came out ‘for real’, they all came out together, wearing their uniforms, and lined up for stretching. Everyone did the same stretches: whether you’re on offense, defense, or a specialist, and whether you be an All-ACC safety like Jeremy Cash, or a back-up punter like Danny Stirt. 3) Leaders set the tone for everyone by their actions, more so than their words. All of a sudden during the stretching Laken Tomlinson, the superstar offensive lineman jumped out of his place in line and started dancing around in the middle of the team. I caught a few seconds of it on video. Hilarious! Laken is a rock star by any measure. He’s the co-captain of the team, a mid-season All American, has a great life story (think ‘Blind Side’), but MOST importantly, is unfailingly gracious with my daughter on the occasions that we’ve had a chance to chat with him after a game. His dance seemed designed to heighten the team’s enthusiasm and intensity, but also remind everyone that they are playing a game – no need to get too tight. BTW, Laken dramatically led by his actions late in the game as well. Duke was up 27-10, with the ball, and eating clock. During a few plays, Laken held his block far downfield from the play, and long after the play was done. I asked him why afterwards – he said the Syracuse defense had been talking smack all game, and he needed to respond. He sure did, but as a great leader, he used his actions and not hollow words. 4) The team ‘wins’ if and only if each ‘working team’ does their part. A football team is comprised of ~100 players (~65 travel to away games) plus ~15 coaches. It’s a really large organization. What I clearly saw Saturday is that the team really operates as 3 largely separate units – the offense, defense, and the specialists. When the offense was on the field, the defense was huddling, and vice versa. The specialists were constantly working together to be at the ready. Meanwhile, as the action on the field would allow, people also informally gathered in little clumps to just chat among themselves – my daughter, being the real expert on the team in our family, often pointed out that these often were just groups of friends hanging out. A lesson here for me is that you may ‘only’ be the member of a single department in a bigger organization, but each person needs to be ready to contribute. You really don’t know how things will go on any particular day. For instance, Saturday’s game was a genuine team effort that turned on a great punt from Will Monday that pinned Syracuse deep in their own zone. The defense held, and the poor field position directly contributed to Jamison Crowder‘s returning a punt for a TD that turned the game in Duke favor in the 4th quarter. Team sports really are Team sports. You win as a team and lose as a team. 5) Leaders: when things go badly, your team needs to know you have their back. 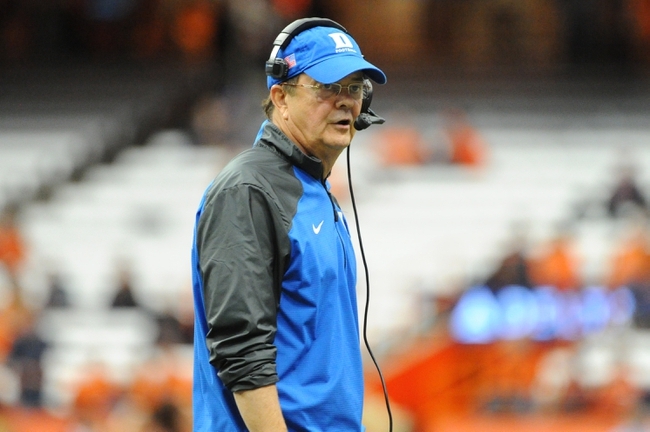 In 2008, after decades (literally) of putting no resources into football, Duke stepped up and hired a superior person who also happens to be a great football coach. He came to Duke despite their having won only 10 total games in the 8 years before he arrived. I started buying season tickets when he came because I KNEW he’d turn the program around, which by golly, he’s done! In the game on Saturday, when Syracuse got a touchdown to tie the game at 10, the defense came to the bench seeming a little down. Shortly after they sat down on the bench, Coach Cutcliffe strode over, bent down, and gave positive words of encouragement to the guys. Syracuse didn’t score again. 6) Team members: when things go badly, direct your anger and frustration at the situation and not each other. Playing defense on football is a very intense activity, especially at the major college football level. Naturally, the guys get riled up – if looks could kill. You get the idea. (Dezmond Johnson, you are a scary dude during a game.) I witnessed a lot of screaming, but I didn’t see folks yelling at each other, as if they were fighting or attacking each other. They were just letting off steam or passionately discussing how to adjust. I saw this attitude in spades after the game. Devon Edwards (aka ‘Mr. November’) returned a punt for a TD in the game, but it was called back due a holding penalty. We were curious who caused the flag (the referee’s announcement was drowned out by crowd noise). I asked Devon after the game, assuming he must have been at least a little bit curious whose mistake had denied him his TD. He said he had no idea, and he didn’t care. Duke had won the game. Amazing! 7) When things go right, celebrate (even if you didn’t make the ‘play’). Will Monday, the punter, demonstrated this trait throughout the game. Unfortunately for Duke, he was a very busy man Saturday, having to punt 7 times. He still seemed always to have a positive word for a teammate as he made his way from the field, down the bench, back to his fellow specialists. Will wasn’t alone though. When Breon Borders made his 2 interceptions and Issac Blakeney his two TD’s, the entire bench erupted. 8) Mistakes (and critics) are inevitable. The team is bigger than you or your mistake, so shake it off. My daughter’s favorite player is Max McCaffrey, a wide receiver. As a result, I tend to keep my eyes on what he’s up to, as I know she’ll want to talk about it. Max shook it off and helped his team when the flow of the game allowed. He was the intended receiver on another ball that was poorly thrown, so he wisely turned into a DB and prevented the interception. Max knows you have to do your best, one play at a time. 9) Live in the moment (especially when you’ve had a success!). 10) There’s a lot of good that comes from simply being nice. Family and fans of the team greeted the team after the game, as they made their way to the team buses. Abigail loves to chat with her heroes after a game, and the guys are always a class act. Here you see DJ Reeves, Mike Ramsay, and Josh Snead – great athletes and even greater guys. 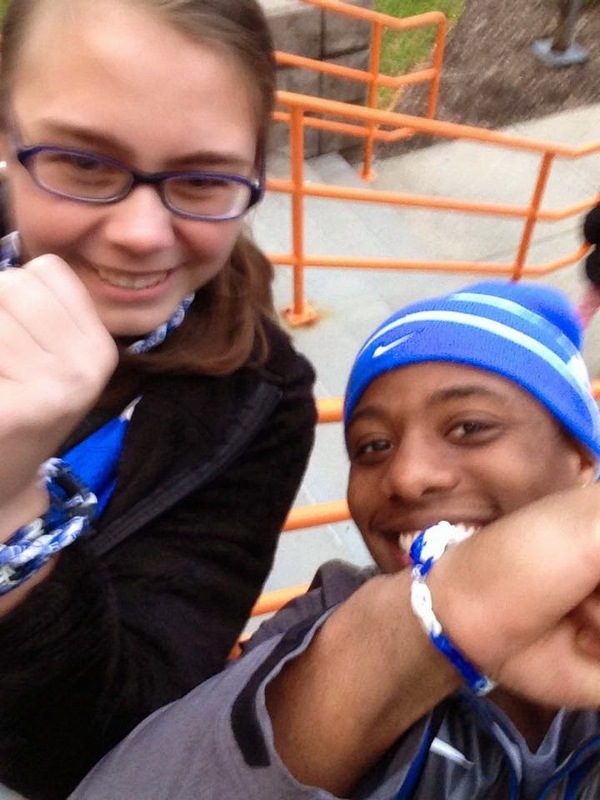 From simply being nice, they enrich the connection Abigail and I have with Duke and the football team, in particular. I also sincerely believe it helps the team’s karma. No reason the football gods shouldn’t look kindly on a set of guys who are great role models for teamwork to all Duke fans (yes, athletes CAN be role models). 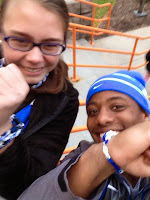 This entry was posted in Collaboration, Communications, Duke Football by pmiller55. Bookmark the permalink.